Toyota may be late to the crossover game, but the introduction of the 2017 Toyota C-HR will be sure to excite anyone driving on a Hilton Head Island road. With a variety of unique design ideas and the right type of performance, this is definitely a vehicle for those with a go-get-her attitude looking for excitement. Take a look below to learn more about this new model and how it can change your driving experience for good. The 2017 C-HR brings a different style to the forefront. This model includes four doors and rides much lower than your traditional crossovers. The exterior body style includes multiple creases, which gives the model a truly unique look. In addition, when the light catches these creases, it offers a brilliant look unlike any other vehicle on the Savannah roads. LED headlights stretch back over the wheel arches to make them stand out, and the rear door handles are found closer to the roof than in the middle of the doors. Finally, the LED taillights seamlessly wrap around the exterior to create a stunning look that’s truly one of a kind. 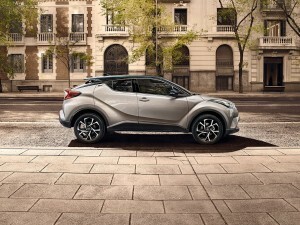 When you see the C-HR for yourself, you’ll certainly enjoy what you see under the hood. This model comes with a 1.2L turbocharged four-cylinder engine or a 1.8L four-cylinder hybrid model. In addition, there are also talks of an exclusive US-only engine: a 2.0L four-cylinder that is paired with continuously variable automatic transmission. Finally, four-wheel dive is likely to come standard on this new model. Although release dates and pricing have yet to be release for this new model, the 2017 Toyota C-HR will bring a ton of fun to the area. With its eclectic design features and array of performance options, this model suits all your needs, and then some. Visit Savannah Toyota today at 11101 Abercorn Street in Savannah to see our current inventory or learn more about the upcoming C-HR. In addition, you can also contact us online or by calling (855) 411-6139 to schedule a test-drive or start the application process. Visit us today.